Rebecca Richman Cohen is an Emmy Award nominated filmmaker and a lecturer on law at Harvard Law School. She interned as an investigator at the Bronx Defenders and continued to do investigative work at the Special Court for Sierra Leone, working on a legal defense team for Alex Tamba Brima in the AFRC-accused case. Five months after leaving the Brima defense team, she returned to Sierra Leone to begin production on WAR DON DON, which profiles the trial of a leader of a separate warring faction. Between trips to Sierra Leone, she has been adjunct faculty at the Rhode Island School of Design (RISD) and American University’s Human Rights Institute. Rebecca graduated from Brown University with a B.A. in Portuguese and Brazilian Studies and with a Juris Doctor from Harvard Law School, where she now teaches. 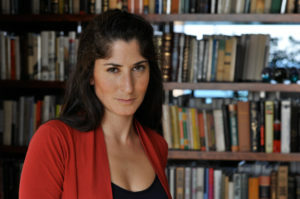 For her work on WAR DON DONshe was awarded the the Cinereach Award for excellence in vital, artful storytelling and the Hugo Munsterberg Award for psychology of human nature in cinema. WAR DON DON also won the Special Jury Prize at the SXSW Film Festival and was nominated for two Emmy awards: Outstanding Continuing Coverage Of A News Story (Long Form) and Outstanding Editing. In 2010 Rebecca was profiled in Filmmaker Magazine's 25 New Faces in Independent Film as an “up-and-comer poised to shape the next generation of independent film."